The San Francisco Municipal Transportation Agency (SFMTA) Board of Directors yesterday unanimously gave the green light to a project that will convert the easternmost block of Haight Street to two-way bus operation. When constructed in 2014, the project is expected to improve transit reliability for the roughly 20,000 daily riders on the 6 and 71 Muni lines by eliminating unnecessary detours that delay buses behind congested car traffic. Britt Tanner, the head of the project for the SFMTA, addressed fears voiced at the hearing by several committed detractors of the project who live on the affected blocks. They contended that the change will add danger to the intersection of Market, Haight, and Gough Streets, which buses will cross in the opposite direction under the redesign. “This project actually has many safety improvements included in it,” said Tanner, citing sidewalk bulbs, pedestrian signals, pedestrian refuge islands, and crosswalk realignments. She also noted that vehicle crashes at the intersection have dropped 75 percent in recent years after traffic signal improvements were made. The redesign will convert a car parking lane on the south side of the easternmost block of Haight to an eastbound bus-only lane. That arrangement was based on community concerns raised at workshops over inviting unwanted vehicle traffic to use the new cut-through to Market Street. But removing one of the westbound traffic lanes instead would further improve safety, said Livable City Director Tom Radulovich and Walk SF Executive Director Elizabeth Stampe, who otherwise voiced their support for the project. It would be nice were there some bike accommodations on Haight. @68ed6abcce0bc3f33388cfb818e1c07d:disqus Having sharrows on a parallel street isn’t really the same thing, is it? – Could they preserve the south side parking spots by just making it one lane each way? They have to accommodate motorists blocking traffic while queueing for left turns onto Octavia, similar to the three-lane approach from the West. I’d be happier if they just made it no-left-turn. The parking spaces were made up on adjacent blocks by eliminating bus stops. I’m sure as hell not going around. did we just lose a bike lane on mid-market? 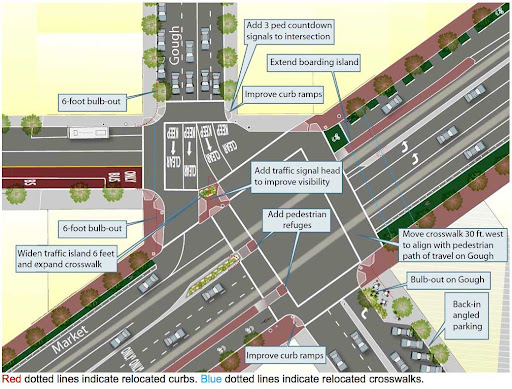 This last SFMTA image shows sharrows. We may only have a dashed-green bike lane there right now, but that’s still better than sharrows. Actually, that image is a bit out of date – my apologies for not providing the newer one. Haighteration has the updated version, which shows the green Market Street bike lanes as I believe they are today. Another small step forward for San Francisco, hooray. Director Joél Ramos’ comment is fantastic and insightful. If only more leaders saw the bigger picture. Such an attitude should be followed by all who manage and fund transit at Muni and elsewhere. I recently experienced back-in angled parking while in Austin. I was not impressed with it, and I don’t think it will be a good fit for SF. One of the supposed benefits–the ability to see oncoming traffic when pulling out–didn’t exist. At least my car’s back-up lights come on when I pull out of a forward-in angled parking space, giving approaching traffic some idea that I will soon be entering their lane. they have back-in angled parking on Townsend beteen 4th and 7th and it is a huge improvement. Wow, you’re removing even MORE parking for the merchants of upper market? No wonder it’s a dead zone with almost NO business left. I can’t even park anywhere close to U-Frame It with my Zipcar. Big glass frames are simply not something I can take on Muni. My friend who owns the former Octavia Lounge had his business simply tank after all the parking was taken out for a bike lane, with no discussion, just a rubber stamp. In a business climate like our’s you’d think we’d want to do everything possible, not punish customers by making it so inconvenient they avoid the area altogether. Another problem for disabled…there’s no place to pull to the curb to drop them off. My dad has to get our of the car in the left lane of Market Street because the right land is coned off for bikes. Someone is going to sue. It’s only a matter of time. Please! keep SOME parking for when I have to rent a Zipcar! I can’t carry everything on Muni. Must I drove to Colma to shop?